We offer film digitizers for rental or purchase. Renting is a great option if you wish to digitize your existing film library. By converting your film images to digital you can clear out your library to make additional room in your office. It greatly aids in completing comparisons of current digital images to older film images. Films can also be copied to disk instead of giving out the originals. 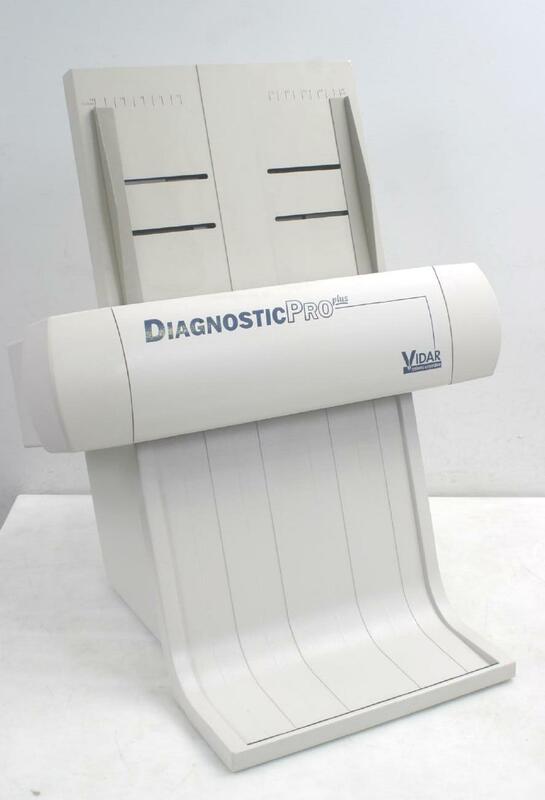 The DiagnosticPRO™plus Film Digitizer from VIDAR Systems Corporation was developed in response to clinical demands for a high quality, productive, and reliable x-ray film digitizer for PACS and remote primary diagnosis. The DiagnosticPRO plus features the company’s next-generation, proprietary High Definition CCD (HD-CCD®) technology. It incorporates a substantially more sophisticated HD-CCD array and digital electronics design that expand the optical density range and deliver unmatched image quality. Its unique ADC™ (Automatic Digitizer Calibration) feature results in virtually no variation in image quality and ensures excellent grayscale reproduction in every image. The DiagnosticPRO plus, with its highresolution capabilities (44.5 microns), provides the ability to digitize mammography films, and offers larger spot size options for digitizing general radiographic, CT, MR, ultrasound, and nuclear medicine films. The DiagnosticPRO plus exceeds the American College of Radiology teleradiology practice guidelines. In addition, VIDAR offers the only 16-bit A-to-D converter in the industry to maximize grayscale accuracy. A growing number of clinical studies at leading institutions such as Johns Hopkins University and the Mallinckrodt Institute of Radiology have demonstrated that there is no difference in image quality and radiologists’ ability to make correct diagnoses between radiographs digitized on the DiagnosticPRO plus and comparable laser systems. In addition, radiologist preference studies have concluded that the majority of radiologists either preferred images scanned on the DiagnosticPRO or had no preference between DiagnosticPRO and laser-scanned images. VIDAR’s digitizers are supported by a premier customer service department and have been field-proven for reliable performance in more than 300 mobile radiology vans. They have a MTBF of more than four years, and have successfully completed extensive shock and vibration evaluation, undergoing 40 hours of testing — the equivalent of 40,000 miles — in accordance with the MIL Standard. A built-in, 25-sheet mixed-size film feeder increases productivity by reducing time involved with digitizing films. The premier digitizer on the market today, the DiagnosticPRO has qickly become the digitizer of choice for more than 100 leading PACS solutions providers.